Estabanez is a cross-code player who is equally adept at centre and fly-half. He was well established at Brive between 2007 and 2011 but he will line up for Racing Metro in the 2011-12 Top 14 season. Having played rugby league at youth level with Pamiers XIII and then Limoux XIII he switched code to play for U.S. Colomiers. However his time in rugby union was shortlived and he soon switched back to rugby league in 2001 to play for Limoux XIII again before transferring to Toulouse Olympic. 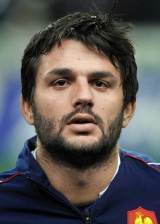 In 2006 he decided to switch to rugby union where he joined Rugby Club Gaillac who were in the Pro D2 at the time. However, after an impressive season he joined Top 14 side Brive. He was called into the France squad for the 2010 Six Nations but had to wait until November 2010 for his debut against Fiji. And Estabanez will join Racing Metro for the 2011-12 season but his arrival in Paris will have to wait as he has been named in Marc Lievremont's 30-man squad for the 2011 World Cup.